There’s a s’more. Then there’s a S’MORE! 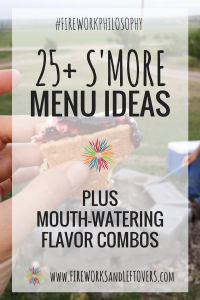 And I’m sharing 25+ s’more menu ideas for your campfire gatherings. The best s’more experience, in my opinion, is searching for a stick from the yard, slapping on a jumbo marshmallow, roasting it over a fire until it’s nice and burnt and piling on the tasty toppings. There’s just something about summertime, sitting around a fire with people you enjoy spending time with and a sticky, messy, sugar-filled treat. I love a classic graham cracker, marshmallow and Hershey’s chocolate s’more just as much as the next person but there are so many other tasty possibilities out there that are just waiting to hit your taste buds. 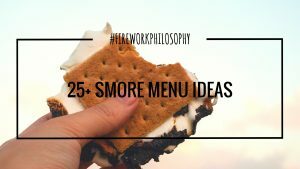 Here are 25+ s’more menu ideas to inspire even more great summertime memories! Let’s start with the cracker/cookie base – the foundation of the s’more. There’s such potential to add delicious flavor and texture. Now, in my experience, there can be some pretty strong opinions about the perfectly roasted marshmallow. In my opinion, you’ve got to torch that puffy ball of sugar. The burnt goodness maximizes the gooey qualities of a marshmallow and adds an extra layer of smoky flavor and texture. Regardless of your marshmallow preference, the soft and fluffy cloud of sugar is the pillar of any great s’more. You could even up your marshmallow game with gourmet options like these lemon chiffon marshmallows. I’d roast that a bit (maybe not to my normal burnt level), slap it between two honey graham crackers and add some sliced strawberries and call it dessert! If you’re a coconut fan, these toasted coconut marshmallows combined with a Ghirardelli caramel square would be phenomenal. What’s your favorite s’more combination?